Growing up there are pivotal musical moments in our lives. I loved the poppy side of the sixties, The Beatles and much that went before, then comes the development of your own taste. For me, initially it was early Bowie, introduced by my older mate Steve. This was my music, I still loved Slade, The Sweet and much of the bumptious Glam Rock, but Bowie was different. So to Junior’s Eyes, from 1969 and prior to that Bowie sound. Well maybe not. 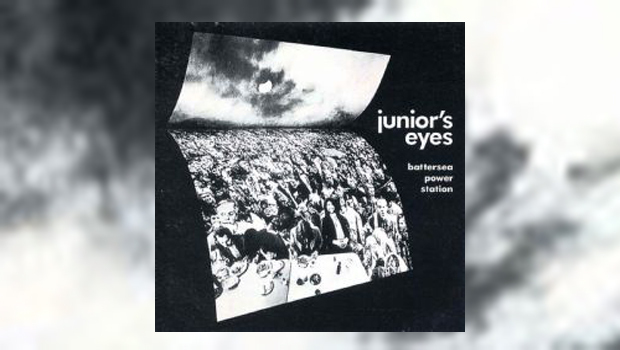 Junior’s Eyes was the brainchild of Mick Wayne, members of the band going on from here to join the reborn David Jones, and that quintessential early Bowie sound can be heard on this album. Mick Wayne was much feted by the music industry of the time, admired and invited to collaborate with his influence being heard beyond the confines of this album and the accompanying bonus disc of extras. So this is a bit of a revelation, well at least for me. The album contains quite extensive notes, so I won’t bore you by repeating what is an interesting read and will just stick to the music. There are two albums here, Battersea Power Station and a collection of extras, demos and BBC sessions. The album opens Small Faces style and, much as I like the Small Faces, I have to say that I think the vocal performance here is stronger. As a precursor to the Progressive Rock era there is much contained here that I can see was influential in the music circles of the time. It is, of its time, however if you like musical history it is well worth a few listens and some, with the presence of hindsight, is better than the chart material of 1969. I assume that David Bowie must have heard this; broad in its ambition, if justice had prevailed this would have received wider recognition. Mick and his associates seem to have “touched” so many that would later become stars of Prog, Rock, Art Rock, and Pop, and probably a few other genres beside. Mick played on the early incarnation of Space Oddity, he was in an early band around 1964 with Jimmy Page, friends with the future Pretty Things, The Rolling Stones and Andy Warhol, spheres, judging by the contents of this album, in which he did not fail to have influence. Amazing, but no major success for himself, and that would seem to be a shame with the hindsight laid out here. The extensive sleeve notes have been written by Mick’s daughter, Sarah, and David Wells and there is much love in evidence. Mick tragically died in a house fire in America in 1994 but he left a legacy that deserves much wider recognition. The second disc contains demos, singles such as the above 1967 track from The Tickle (was this a good choice of band name?) and Radio sessions for the BBC’s Top Gear, a music programme long before it became a TV show very loosely based upon motoring. I particularly like Circus Days, My Ship and White Light, but much deserves an honourable mention. Give it a listen, Mick Wayne deserves to be remembered, and see how many bits were nicked by successful bands we believed to be original. The music industry is crazy, sometimes completely bonkers even, and many go unrewarded. I think that this album is evidence that there is very little new under the sun. If you like your rock history it warrants a hearing if not a place on your shelves.